Kaname Ikeda looks on as Council Chair Evgeny Velikhov presents professor Osamu Motojima with his ITER contract. 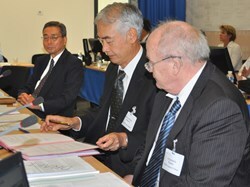 This week, the ITER Council, the Governing Body of the ITER Organization, convened for an extraordinary meeting. 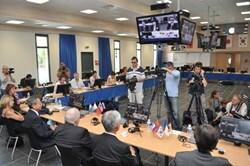 Following the most recent reunion of the ITER Council in China in June this year, in which no agreement was achieved on the funding of the project due the ongoing debate within the European Party, the ITER Members decided to convene again for an extraordinary meeting in order to complete discussions on the ITER Baseline. This updated schedule describes ITER all the way from the beginning of construction, through commissioning, and on to Deuterium-Tritium operation. The main milestones will be the achievement of First Plasma in November 2019 and the start of Deuterium-Tritium operation by March 2027 ultimately taking ITER to 500 MW output power. 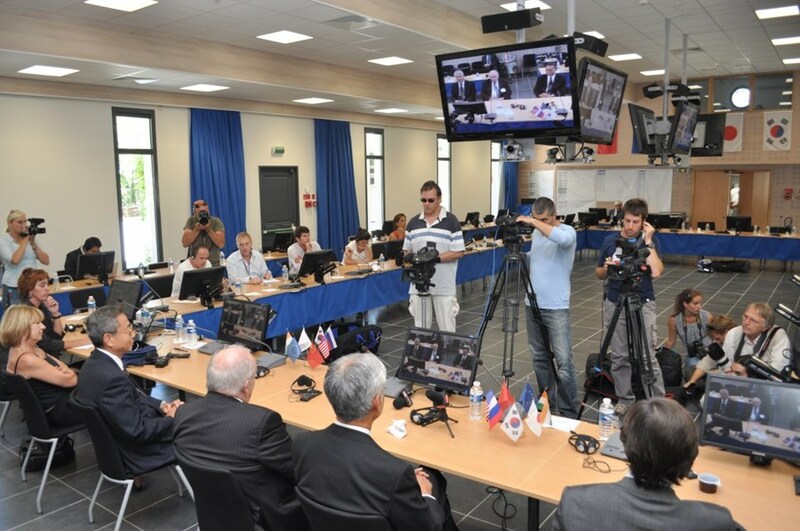 The extraordinary meeting of the ITER Council attracted intense media coverage. The ITER Council unanimously approved this Baseline, and encouraged the ITER Organization to explore ways to optimize the schedule in order to begin Deuterium-Tritium operation in 2026, if possible. Another important decision of this extraordinary meeting was the appointment of Prof. Osamu Motojima as new Director-General of the ITER Organization. Prof. Motojima is taking over the leadership from Kaname Ikeda, who has led the ITER Organization since November 2005. Osamu Motojima, a well-known and much respected figure in the field of fusion science in Japan and abroad, was formerly Director General of the Japanese National Institute for Fusion Science. In his first press conference Prof. Motojima stated that the approval of the Baseline symbolized a landmark day for the ITER project. The chairman of the ITER Council, Evgeny Velikhov, added that "what we are achieving here is to ensure not only the success of ITER but also the success of fusion." Click here to read the Press Release in French.